Jungle Hijinxs in Super Smash Bros. for Wii U. Jungle Hijinxs (バナナジャングル, Banana Jungle) is a stage exclusive to Super Smash Bros. for Wii U, based on the level of the same name from Donkey Kong Country Returns. The stage features two planes that fighters can travel through via Barrel Cannon. Characters can use the Barrel Cannons to travel between the foreground and background areas. After doing so, a character will be covered in flames for a while; the flames do no damage, but attempting to use another Barrel Cannon before they go out will result in an explosion. This is intended to prevent players from stalling by using the cannons repeatedly, though sometimes a player will be able to use multiple Barrel Cannons in a row. The Barrel Cannons switch out during battle and move to different parts of the stage. When a player activates his/her Final Smash, all Barrel Cannons switch out. Occasionally, the middle part of the foreground will crumble away and reveal a Barrel Cannon. It explodes after use and leaves the pit open until the ground regenerates. A Screaming Pillar may also appear on the right side of the stage between the foreground and background. Blasting into it from the foreground will cause it to fall toward the background and damage anyone it hits. To compensate for the further distance from the blast lines, attacks in the background plane cause more knockback than normal. Dragoons can hit any character in both planes. The Ω form is set on a flat version of the front plane. The barrels, soft platforms, and the rear plane are absent (except for the structure that normally holds it). Star and Screen KOs occur, making this the only stage where both Star and Screen KOs occur on the Ω form but not on the normal version of the stage. Jungle Hijinxs as it appeared in Donkey Kong Country Returns. Jungle Hijinxs is the name of the first level of Donkey Kong Country; however, the first level by the same name of the Wii game Donkey Kong Country Returns is what this stage is based around. It is a near exact replica of the part of the level that first introduces the dual planes mechanic and accurately recreates that game's mechanic of using Barrel Cannons to travel between the foreground and background, although the idea of a cooldown time between cannon uses is unique to Smash Bros. In Donkey Kong Country Returns, the Tiki Tak Tribe took over Donkey Kong Island and stole Donkey Kong's Banana Hoard to make more Tikis. Throughout the course of the game, Donkey Kong and Diddy Kong fought various Tiki enemies, including Tiki Buzzes (which appear in Smash Run) and Screaming Pillars. Whenever Donkey Kong would approach them, they would fall headfirst to the ground and damage him if he came in contact with them. Once they fell, they could be destroyed by Donkey Kong's Hand Slap. Giant Pillars also appeared in some levels of the game. Strangely, they appear in the sequel, Donkey Kong Country: Tropical Freeze, in the level Scorch 'N' Torch despite the other Tikis being absent after their defeat at the end of Donkey Kong Country Returns. On Jungle Hijinxs, Screaming Pillars occasionally appear and can damage falling fighters who happen to make contact. The stage is banned in tournaments due to the dual planes mechanic interfering with usual play, as well as the size of the background allowing for camping. Also, since the foreground and background can collapse, this is seen as a stage hazard. In Training Mode, if a player is about to run into a Screaming Pillar, pausing the game will make the character go through the pillar as if it wasn't even there. The Screaming Pillar will lower back out of sight. Keldeo is not known to appear on this stage. 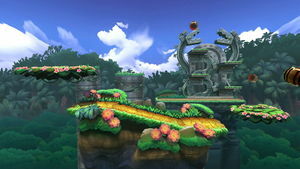 Jungle Hijinxs is one of five stages from Super Smash Bros for Wii U not to return in Ultimate, the others being Orbital Gate Assault, Pyrosphere, Woolly World, and Miiverse. This was likely due to the new Stage Morph option, as no other stage has a background arena. Donkey Kong charges a punch in the background, as fighters make their way there using the Barrel Cannons. Mega Man busts out his Black Hole Bomb on a wall as Donkey Kong respawns in the foreground. A showcase of what typically happens during a fight on this stage. A Screaming Pillar, just after deflecting a shot from a Barrel Cannon. Arrows appear on the sinking stage, indicating both that the stage is crumbling, and where the Barrel Cannons will be. The entire background has sunken, and a collision has occurred in the foreground.